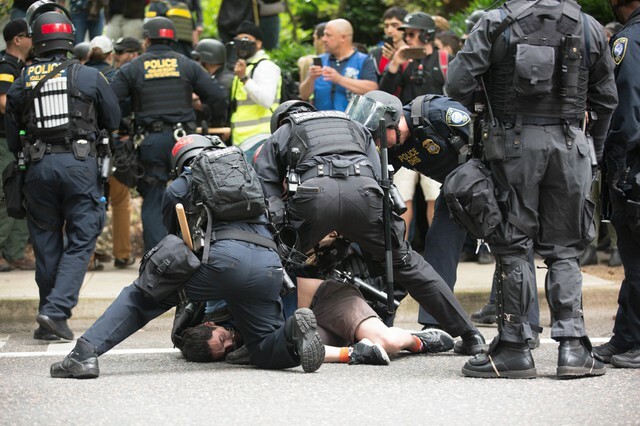 by OPB Staff OPB June 4, 2017 11:54 a.m. | Updated: June 5, 2017 7:44 a.m.
Thousands of people converged on downtown Portland Sunday, June 4, 2017, for a Trump Free Speech Rally and a series of counter-protests. The demonstrations came a little more than a week after the fatal stabbing of two men on a light-rail train by a man police say was shouting anti-Muslim slurs. 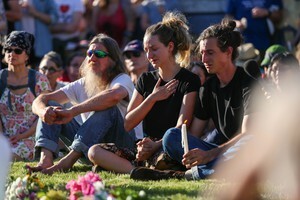 Several thousand people gathered in downtown Portland Sunday for competing right- and left-wing rallies following the fatal stabbing of two men by a man shouting anti-Muslim slurs. The day of speeches and chants was ending in chaos late Sunday afternoon after police say Antifa protestors threw bricks and other projectiles at them. That prompted officers to close two public squares and use pepper spray, flash-bang grenades and rubber bullets. They also detained several dozen left-wing protestors, though it’s not yet clear how many people were actually arrested. Online threats of violence prompted a large law enforcement presence as police attempted to keep protesting groups separated. Even before the events were officially supposed to begin Sunday, hundreds of police in riot gear were in place to block the streets separating a pro-Trump free speech event at Terry Schrunk Plaza and counter demonstrations by progressive groups on multiple sides of Schrunk Plaza. Across the street, at the right-wing rally, Robert Montgomery said he’d come from Pleasanton, California, to thank people from the Pacific Northwest who traveled to Berkeley for pro-Trump protests there earlier this year. Montgomery said he’d also recently protested in New Orleans, where the decision to remove monuments to Confederate leaders prompted clashing events. 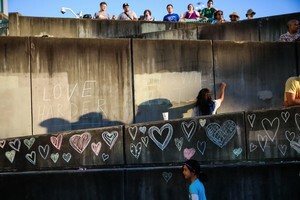 City leaders questioned the timing of the rally so soon after the TriMet attacks. Mayor Ted Wheeler unsuccessfully asked the federal government, which runs Schrunk Plaza, to revoke the permit for the event. And the family of a man who was stabbed but survived asked for organizers to cancel the right-wing rally. Calls to cancel the right-wing event drew more national attention, including the announcement that several leaders in the white supremacist movement would be visiting Portland. The Oath Keepers, a militia group that includes former military and law-enforcement officials, planned to provide security for the right-wing event. After the TriMet attacks, a coalition of progressive groups planned their own rally in response. Civil rights leader Jesse Jackson, who was in Oregon Friday, advised against mounting a counter-protest in downtown Portland this weekend. “Let them march alone,” Jackson said. Some religious groups did decide not to rally, but left-wing organizers opted to continue with their events. Since the election of President Donald Trump last fall, large protests have become common in downtown Portland and tensions have risen between ralliers — particularly those associated with the so-called “black bloc” anarchist movement — and police. Just a few days before the TriMet attacks, the family of a black teenager killed by police as they investigated an armed robbery earlier this year called on the mayor to change the way police regulate protests in the hope of avoiding future violence. Among other changes, they wanted police out of riot gear at political events. If anything, the police presence Sunday was the highest — and most proactive — yet. Law enforcement officials were checking the bags of people entering Schrunk Plaza and had already made several arrests an hour before the right-wing event was scheduled to begin. Officers confiscated potential weapons, including sling shots, flares, sharpened sticks, brass knuckles, metal poles and knives. 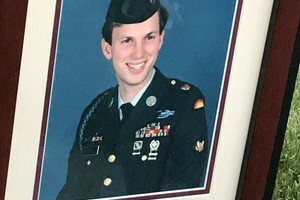 In Schrunk Plaza, some of the protestors at the right-wing rally were dressed in military-style camouflage and American flags, while others wore red Trump “Make America Great Again” caps. They chanted “U-S-A” and “All Lives Matter,” and some shouted “You’re the real Nazis,” across the street at the progressive crowds. Joey Gibson, the organizer of the right-wing event, began it by encouraging the crowd to remember that they’re being watched — and judged. “I’m calling on everyone to please, do everything you can to be positive,” he said. Gibson talked about lessons he learned when he came to downtown Portland to protest for his free-speech rights and yelled back at people who shouted derogatory things at him. He said he realized later he hadn’t accomplished his goal of making liberal Portlanders think about other views. “Portland, I mean no disrespect, but you’ve gotten crazy,” he said. Other speakers denounced political correctness, demanded a federal investigation of Mayor Ted Wheeler for “harboring illegal immigrants” in Portland and called protestors Godless communists. They repeatedly praised the Trump administration. On the left, where the crowds vastly outnumbered the pro-Trump numbers, protestors carried signs supporting gay rights, immigrant rights and Black Lives Matter. The black-clad, masked anarchists who have tussled with police at past events were handing out free ice cream at the start of the day, but by the end, they’d burned flags and some of the more extreme protestors had thrown bricks at police. Around 3:30 p.m., about three hours after the progressive rallies began, police announced that they were closing Chapman Square due to suspected criminal activity. Officers reported someone had thrown foul-smelling liquid inside balloons at the right-wing rally and that others had removed bricks from the public bathroom at Chapman Square. Officers began using flash-bang grenades and tear gas to move people out of the square. Police said protestors had thrown items at officers. After the parks closed, some on the left attempted to march through downtown. Police soon stopped the march and detained about 100 people, including a number of journalists. Most in that crowd were released after officers checked IDs and searched for weapons. By 5:30 p.m., most of the crowd had left downtown. Police were forming a cordon to separate departing left- and right-wing protestors.